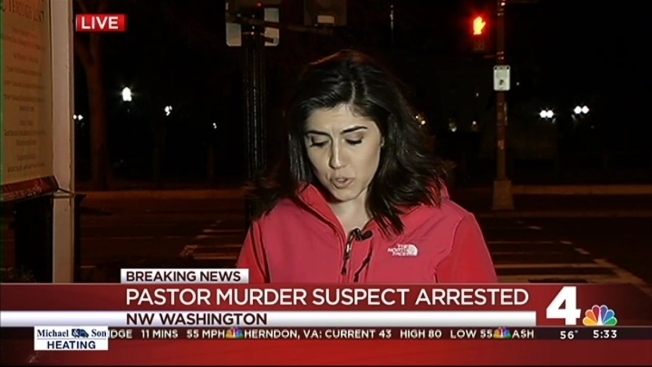 A man wanted by Idaho authorities in an attack that left a church pastor seriously wounded was charged in Washington, D.C., with being a fugitive after being arrested by U.S. Secret Service agents after allegedly throwing items over the fence at the White House, including a "manifesto," police said. Coeur d'Alene Police Chief Lee White said Kyle Odom, a former Marine, was arrested at about 5:30 p.m. Tuesday in Washington D.C., without incident. "I think everyone can breathe a good sigh of relief that at least this part of the case has come to a conclusion," White said. Odom, 30, is set to appear in D.C. Superior Court Wednesday afternoon, to be represented by a public defender. Authorities say Odom shot Pastor Tim Remington shot six times Sunday outside his church in Coeur d'Alene. Remington, 55, has regained consciousness and is talking with his family. He was upgraded to fair condition Monday, NBCNews.com reported. Police said Odom boarded a flight at the Boise Airport sometime on Monday. It wasn't clear how he was able to board a plane with police searching for him. White said he was told that Odom threw computer flash drives and a "manifesto" over the White House Fence. The manifesto mentioned U.S. senators and House members and Israeli government officials by name, NBCNews.com reported. According to NBC News, Odom wrote in documents — sent to news organizations including NBC station KHQ — that "hypersexual" beings from Mars have been controlling human civilization. He called Remington one of those "martians." Odom was arrested after the U.S. Secret Service ran a search for him in law enforcement databases and learned he had an outstanding warrant for attempted murder-first degree in Idaho. He was taken into custody on the outstanding warrant and transported to D.C. police for processing. White didn't give any further details but said the manifesto didn't include specific threats. "It's an interesting read," he said, according to NBCNews.com. The Secret Service said none of the material thrown over the fence was determined to be hazardous. A former Marine from Coeur d'Alene, Odom is suspected of shooting Remington a day after Remington led the prayer at a campaign rally for Republican presidential candidate Ted Cruz. Authorities say there's no indication Remington's appearance with Cruz had anything to do with the shooting, as they work to figure out what motivated the attack in broad daylight in the church parking lot. "However, it does appear that this was a pre-planned attack," White said Monday. "And I will tell you that some details surrounding Mr. Odom's planning are disturbing." He did not elaborate. White said Odom was armed throughout the Sunday service, which he attended before heading out to the parking lot, NBCNews.com reported. Meanwhile, several news outlets in Spokane received letters on Tuesday that purported to be from Odom, Coeur d'Alene police Detective Jared Reneau said. The letters, postmarked Monday, contained references to President Obama, members of Congress, members of the Israeli government, and John Padula, outreach pastor for The Altar Church, where Remington is the senior pastor. "It was extensive and it was disturbing to us," White said of the manifesto. Padula said Remington, who is married and has four children, is in a Coeur d'Alene hospital. "He's whispering and talking to his family a little bit," Padula said. "He's doing absolutely amazing. He gave me a thumbs-up last night when I went in." Remington has no feeling in his right arm, Padula said. The Remington family said in a statement Wednesday, "We are so excited we are safe and my dad can fully concentrate on getting better without worrying about the safety of his family. God is good. Life is getting better by the minute." Remington and his wife have been with The Altar Church for nearly two decades, and they have specialized in the treatment of drug and alcohol addiction, Padula said. The church has extensive programs, including in-patient rehabilitation, for addicts, Padula said. Padula was a meth addict for 17 years before going through the church's program seven years ago, he said. Odom had no connection with the church before showing up before services early Sunday morning, Padula said. The Coeur d'Alene Police Department had issued a warrant of attempted first-degree murder for Odom, who has no criminal record but does have a history of mental illness. Police said Odom drove to the Spokane, Washington, area on Interstate 90 after Sunday afternoon's shooting, according to information from traffic cameras. He then turned south before they lost his trail. White said Odom's car was found in Boise. He said he doesn't know how Odom was able to board a plane when police had issued the warrant for Odom's arrest. "We are thankful for the safe apprehension of our son Kyle," the Odom family said in a statement Wednesday. "As Kyle was not living with us... We are learning of his plans as they are being revealed by the police. We are truly thankful to God he is safe and no one else was injured."